Scientists have developed an ultra-thin tattoo-like patch that when glued to the skin can be used as a thermometer to measure its temperature. A team of researchers from the US, China, and Singapore have created the small patch that looks like a bar-code tattoo and is applied using special glue. It keeps working even when the skin to which it is attached twists and turns. The patch can measure body temperature (at the skin level) very accurately, and over a continuous period of time. Also, because it measures heat at multiple locations (at the same skin site) at the same time, the patch is capable of monitoring heat flow and the constriction and dilation of blood vessels as they respond to the environment around them. The team claims that the patches can work in reverse as well, delivering heat to the skin, if desired, simply by increasing the voltage, ‘phys.Org’ reported. The patch isn’t ready for use by the general population just yet, however, as it still requires an external power source. 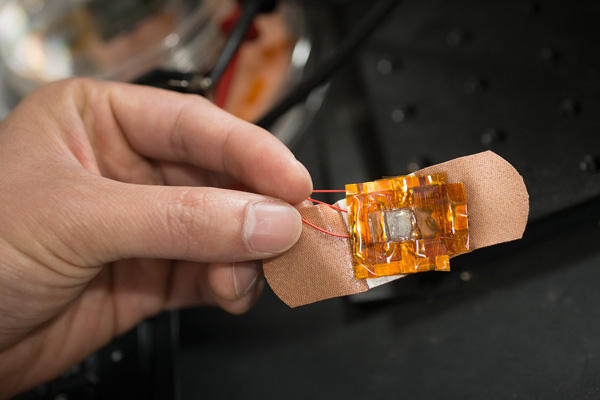 The team is investigating different sources for different types of patches – solar for those applied to the skin and bioelectric for those applied inside the body, such as to the outside of organs.